In response to the latest branding efforts by StuyTown Property Services, which have included new logos for Stuyvesant Town and Peter Cooper Village and a new leasing office now being built in Peter Cooper, some residents have been worried this was an attempt to treat the two complexes differently. Council Member Keith Powers, who said he’d been hearing from neighbors on this issue, sent a letter to ST/PCV general manager Hayduk last Wednesday, asking him to clarify that the branding wouldn’t mean Stuy Town and Peter Cooper Village would no longer have access to the same amenities. Powers also asked if apartments in both complexes would still be available through the lottery system for reduced rents. He also wanted to know if all the marketing would mean existing tenants should now expect diminished benefits and if management planned to reduce staff levels at either complex. Powers also had a question on apartment finishes, asking if Stuyvesant Town apartments would end up looking different from those in Peter Cooper. “As a lifelong resident who has lived in both Peter Cooper Village and Stuyvesant Town, I am concerned that current plans are to put the two properties on a separate path in the short-term and long-term,” Powers wrote. Earlier this week, residents noticed that a new leasing office was being advertised in Peter Cooper Village in the corner space previously occupied by the Petite Abeille restaurant. The slick-looking posters show smiling individuals of various ages, and the property’s very new logo for Peter Cooper. Asked about the advertisements, Stuyvesant Town/Peter Cooper Village general manager Rick Hayduk confirmed there is a new leasing office under construction just for Peter Cooper, but it will be housed in the neighboring 350 First Avenue. This is where another leasing office, primarily a center for brokers’ use, used to be until closing last year. The new leasing office was briefly mentioned in an e-blast to neighbors last week that also mentioned the Stuyvesant Town leasing office would be getting “a refresh,” as would signage and employee uniforms. Tagged Blackstone, businesses, First Avenue, Peter Cooper Village, Peter Cooper Village leasing office, Petite Abeille, restaurants, StuyTown Property Services, Stuyvesant Town, Stuyvesant Town leasing office, Vamos! The Petite Abeille in Peter Cooper Village opened in 2004. Belgian restaurant Petite Abeille closed the last of its locations on Sunday night, which operated in Peter Cooper Village since 2004. The owners announced the closure on the restaurant’s Facebook page on Friday, blaming rising operational costs. However, in recent years, Yves Jadot, who owned the restaurant with his brothers David and Christophe, said it was hard to operate a restaurant anywhere in the city unless it’s very cheap or very expensive. Last year, the original Petite Abeille, on West 17th Street in Chelsea, closed. In 2015, the Tribeca location closed with Jadot saying at the time there was too much competition from food trucks for the local lunch crowd. At one time there were four locations of Petite Abeille in Manhattan, the first one opening in 1995. Petite Abeille, the Belgian restaurant well known for being family-friendly as well as its mouth-watering Croque Monsieurs, will soon be turning 20. July 19 is also when the restaurant in Peter Cooper will be holding its annual Belgian Day celebration, which usually includes a Miss Belgium pageant. As for the art contest the company plans to hold, the winner will get a $1,000 cash prize as well as a life time of free brunch. Details on how to enter will soon be on the restaurant’s website. In an effort to help Manhattan’s mom-and-pop shops, Council Members Dan Garodnick and Helen Rosenthal have introduced legislation to relieve many small businesses of their commercial rent tax. Since 1963, any business in Manhattan below 96th Street paying over $250,000 a year in rent (or nearly $21,000 a month) has been made to pay the tax, which is a 3.9 percent surcharge on the rent. The legislation, introduced last Wednesday, would make the tax applicable only to businesses paying $500,000 or more. To make up for the loss in city revenue, businesses paying over $3 million would get a small increase. That increase would rise slowly as businesses pay more in rent, but at its highest would be an additional one third of one percent on businesses paying over $4 million. While the mayor has not made his point of view known on the bill, Garodnick said his colleagues in the Council have been fully in support of it with the entire Manhattan delegation having signed on as co-sponsors. He noted that while business owners haven’t told him that the taxes alone are killing them, the cost, he said, adds up for small retailers and restaurants, who’ve faced the citywide problem of getting booted out in favor of banks and other chains. The fake buck stops here. Will Hsu, the manager at City Wings, said that at least three different people (two men and one woman) have come in for the past three Sunday afternoons trying to pass off fake Benjamins as the real deal when purchasing small items like sodas. The phony customers have come in at especially busy times but still got caught since Hsu has to personally approve purchases made with large bills. What’s caught his attention is that these bills look completely legit, passing the ink pen test. However, they flunk the smell test when the security line, a strip down the middle of new bills that’s supposed to be strong, has ripped easily each time. 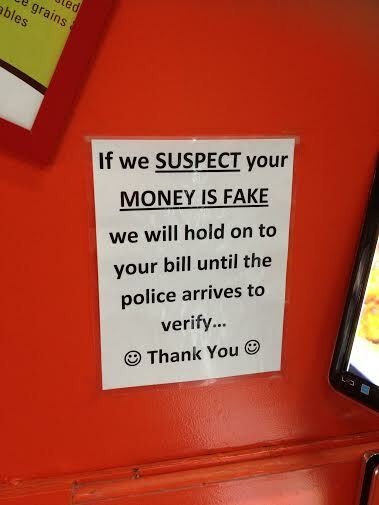 On Tuesday, Hsu put up a sign on City Wings’ door, warning would-be fraudsters that the next time a bill is suspected of being fake, police will be called. He also said it’s a heads-up for the other restaurants in the neighborhood. Yves Jadot, one of the owners of the restaurants Petite Abeille and Vamos, which are across the street from City Wings on First Avenue, said he was not aware of anyone coming in recently attempting to pay with fake hundreds. Rather, it’s simply a problem his restaurants deal with from time to time. More often people will attempt to pay with fake twenties since it’s known employees check the hundreds. “When someone buys a coffee with a hundred it’s a red flag,” said Jadot.